Shaz by the Sea: Law school is ALMOST OVER!! Jim has his LAST class tomorrow night!!!! I can tell he is jumping out of his skin, as am I. He actually said to me this morning, "Shaz, should we have a party when I'm done with school?" (In other words -- "Shaz, throw me a party when I'm done with school"). Whichever way he approached it, he definitely deserves a monstrous party. For his birthday last year, I rented a boat for a few hours and we went out in the marina with about 10 friends. It was so fun. I could tell he loved it. Maybe we can do something like that again...or maybe we just have a huge party here at our place. We'll see...stay tuned for that decision to be made. Today I am still in the process of cooking up everything in my fridge. I was craving hash browns, and since I had a couple sweet potatoes in the fridge, I decided to make sweet potato hash browns with scrambled eggs...and whatever else we had. They were AMAZING. 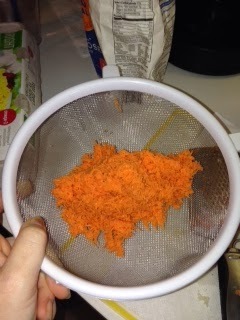 They certainly are a must-try, if you have the patience to grate a few of the sweet potatoes. Totally worth it. 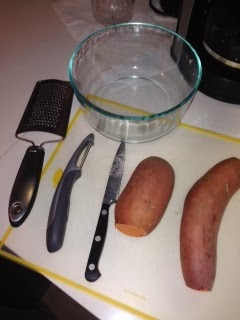 I had two sweet potatoes and needed to wash, peel and grate them. I took out the necessary items in order to make the smallest mess possible. 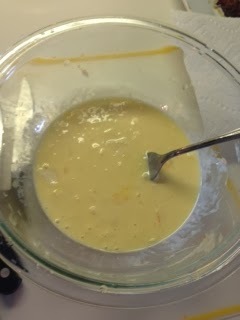 In addition to the items pictured, I also used some sea salt, fresh ground pepper, onion, olive oil and flour. I transferred the grated potatoes to a bowl, and added some minced onion, flour, sea salt and fresh ground pepper. 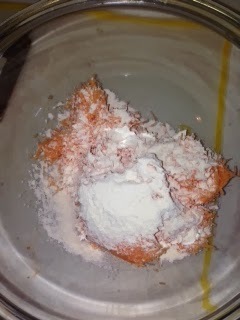 I mixed it around with a fork to get it mixed real well. 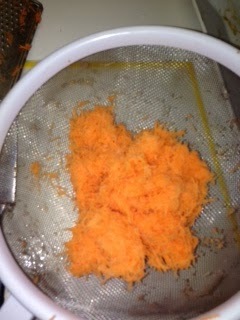 After mixing, I separated my large pile into four smaller (even sized) piles to then transfer to the sauté pan. I borrowed this trick from Rachel Ray. She always says to do this when making burgers, so you have even sized burgers and not three nice sized ones and then a tiny kids-size burg. I placed a decent amount of olive oil into the sauté pan (feel free to use coconut oil) and waited for it to become REAL hot. 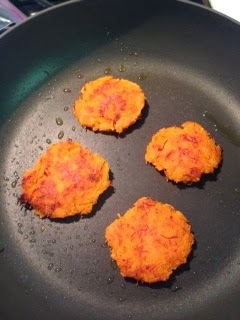 You can test this by dropping a tiny bit of sweet potato in the pan to see if it sizzles. Once it sizzles, you are ready to go. 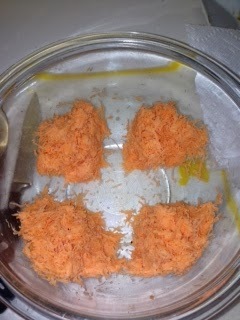 After firming up the little piles one by one, I then placed them in the pan. It sounded perfect! I let them cook for about 5 minutes on the first side (careful not to burn the bottom) and then flatted them with my spatula, and flipped. I cooked them on the other side for another 5-7 minutes so that the inside was cooked thoroughly. 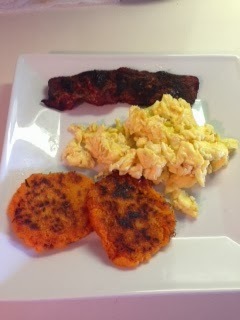 And here's my finished brunch....with an extra crispy turkey bacon slice on the side! It was so filling. We both loved having a different side with our eggs. 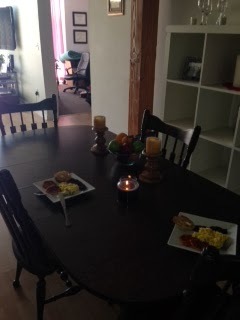 Here is our kitchen table where we ate our brunch this afternoon. :) I needed to light a candle because the neighbors below us were smoking cigarettes and the smell was making me ill.
Is this how you got the crab cake idea?? No! Not at all - I actually completely forgot about this recipe. These were AWESOME!